Making the right diagnosis code selection requires having adequate clinical detail. 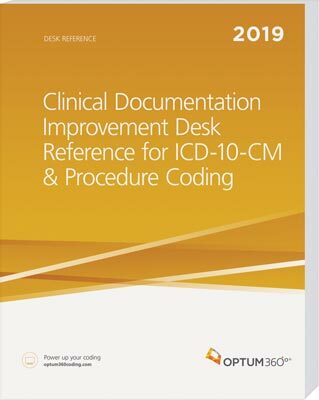 This ICD-10 manual provides the resources you need to gain physician cooperation and to enhance coding through clinical documentation. Correct ICD-10-CM coding through improved clinical documentation. Get 5 CEUs from AAPC and Optum360's certificate of "CDI Skills Proficiency" when you pass the online exam. Optum360 Edge—The “Clinician’s Checklist for ICD-10-CM.” Make copies of this handy tri-fold, pocketsize card for every clinician. Provides powerful documentation tips for the 5 most important chronic and acute conditions. Don’t teach your clinicians to code ICD-10-CM. Instead show them what you need for optimal code assignment.